Many people don’t know it, but Disney also hires work at home employees. (Yes, these are legitimate work from home jobs, not scams. The jobs are listed on Disney’s site.) Right now, they’re advertising openings for Guest Services Representatives. You’ll be taking inbound calls and emails to help customers of Disney Stores. Currently, they are hiring in the following states: South Carolina, Kentucky, Georgia, Nevada, and Arizona. PLEASE DO NOT APPLY IF YOU DON’T LIVE IN ONE OF THE HIRING AREAS! “The Cast Member’s primary responsibility is to create Magical Moments for Guests of all ages, as well as ensuring a superior Guest experience. This is achieved by engaging and providing Guests with entertaining and magical interactions when they connect with the GSC. This is a part time, non-exempt position, working from home. Click here for full details and to apply. To be the first to hear about our jobs and side gigs, like our Facebook page and check your feed for our posts. Good luck in your work from home plans! 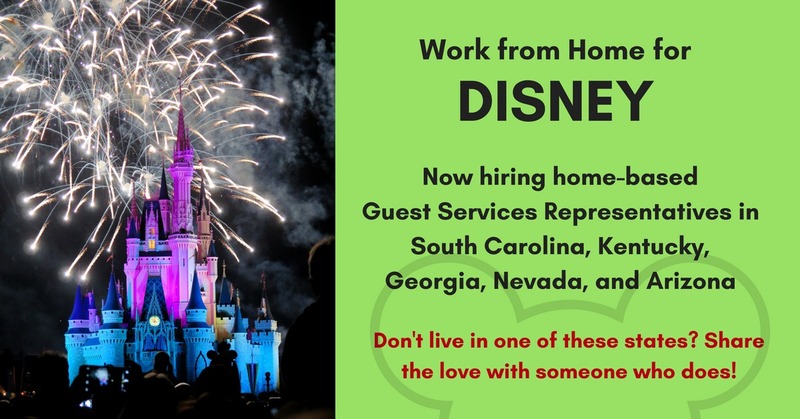 This entry was posted in Customer Service Jobs, Part-Time Jobs, Work at Home Jobs and tagged Disney. Bookmark the permalink.